It’s no oversimplification to say that until my twenties, there was no concept of gumbo in my life other than what my mom made. This is not a pointed literary exaggeration, it’s a fact of life shared by pretty much every gumbo eater across Louisiana. Gumbo is what your momma made, a definition that assures that there are as many different types of gumbos as there are mothers who make them. Sometimes it’s caramel colored roux, okra, tomatoes, shrimp and crab seasoned delicately and thickened slightly to the viscosity of a soup. Sometimes it’s a chocolate brown roux, thick as a stew and brimming with lumps of chicken and sausage. 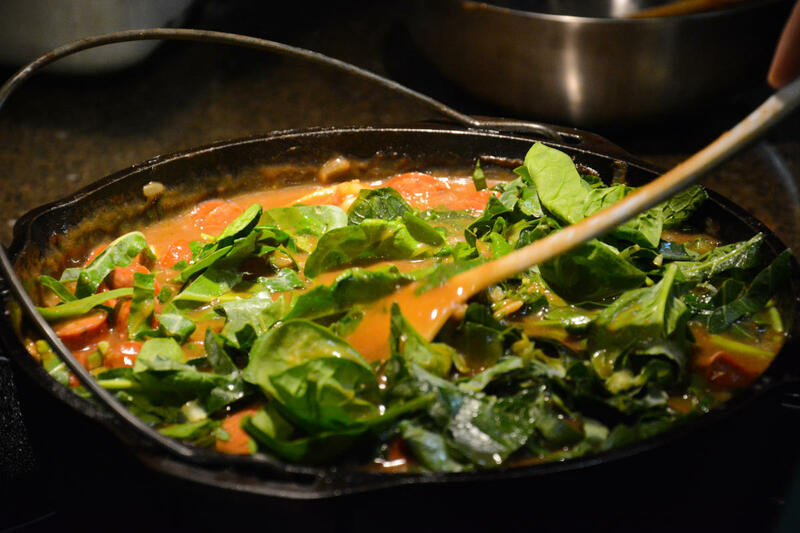 Still others have no roux at all and are served entirely with greens and legumes. Gumbos are typically served over steamed white rice, but some tables prefer sweet potatoes or potato salad. The variation is maddening when trying to sort out what makes gumbo, gumbo. 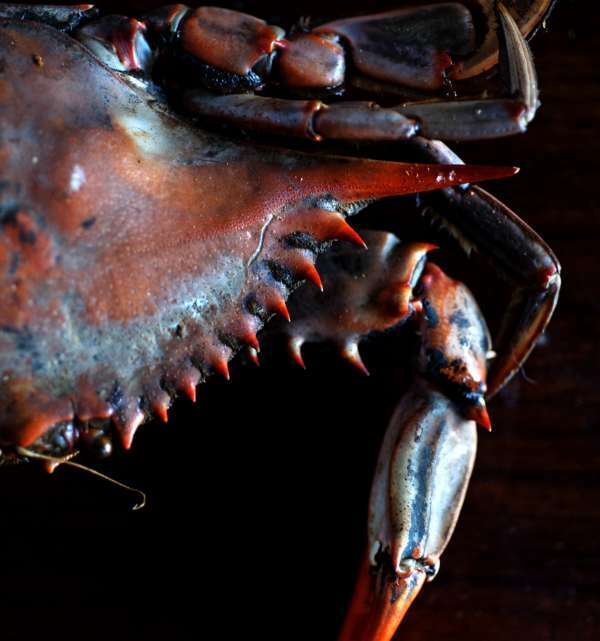 Tethered to maternally inherited convictions, my own gumbo quest nearly drowned me in delicious but unsettling waters. When I was in college, I came across a can of Campbell’s Chicken and Gumbo Soup at a Kroger grocery store near my house in Atlanta, and chuckled arrogantly at the ingredient list: tomatoes (diced), tomato puree, chicken meat, rice, andouille sausage, celery, okra, bell peppers. Tomatoes? Okra? Not even a cursory milligram of roux? I was young and naive. As far as I was concerned that was no gumbo. No sir. My culinary tower was but a house of saltine crackers, soon dipped in the murky stews of gumbo history, sogged to its base, and collapsed. Details about the origins of gumbo are murky. A dish called gumbo doesn’t really show up in historical record until the beginning of the 19th century, when the word starts showing up prolifically in correspondence. 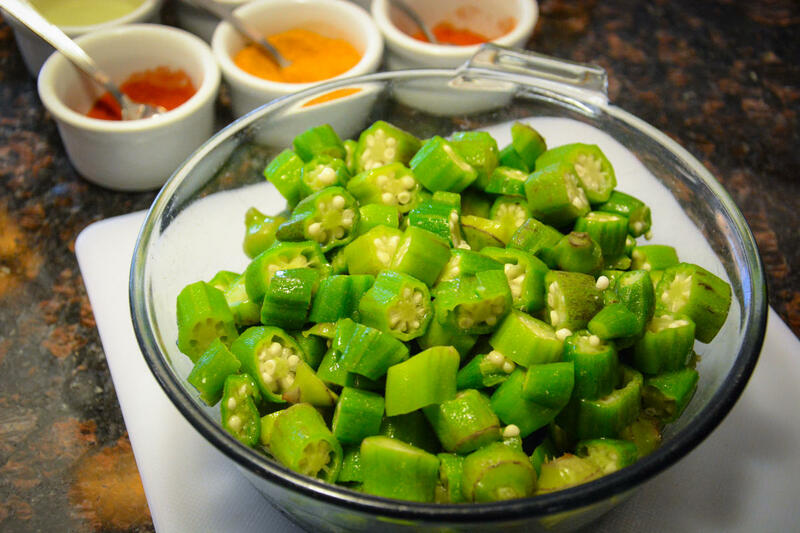 What it was isn’t exactly clear except that it most likely included okra, given that the name derives directly from the West African word for the gooey vegetable, kimgombo, and was served primarily with seafood. African slaves arrived in the port of New Orleans toting okra seeds and a rich culinary tradition that became profoundly influential on Creole foodways. Mingling with the rich variety of European and Native American food traditions that converged in New Orleans, gumbo emerged from the void a broth thickened with okra and served over starch, at that time a corn meal mush. This was the primordial gumbo. Over the next 100 years, that soup-like substance evolved into what we moderns call gumbo. 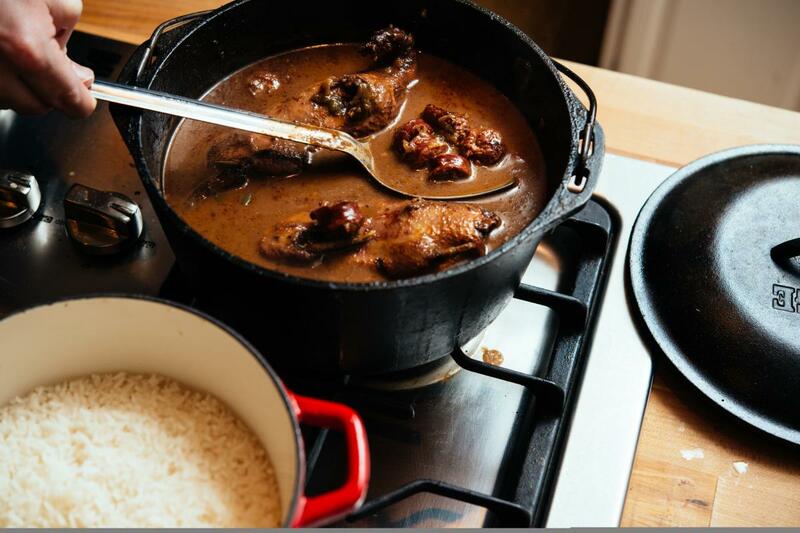 By 1885, La Cuisine Creole, one of the earliest published Creole cookbooks, documented several different recipes for gumbo (called gombo in the book), served over rice with a variety of proteins. Recipes for chicken and okra, oyster and okra, shrimp and okra, or just okra gumbos are included noting that they are “a most excellent form of soup” particularly well suited to re-using leftover meats and vegetables. Rice became the ubiquitous base when German and Acadian farmers across the state began cultivating the grain in commercial quantities in the late 19th century, making it a cheap and available starch statewide. Innocuous though it may seem, that Creole cooks considered gumbo a soup is integral to seeing a division in the conception and creation of the dish as it is found across Louisiana. Growing up in Lafayette, what my mom made was a salty, luscious mélange of tender chicken and smoked andouille sausage swimming in a fresh chicken stock thickened by a roux the color of café au lait. 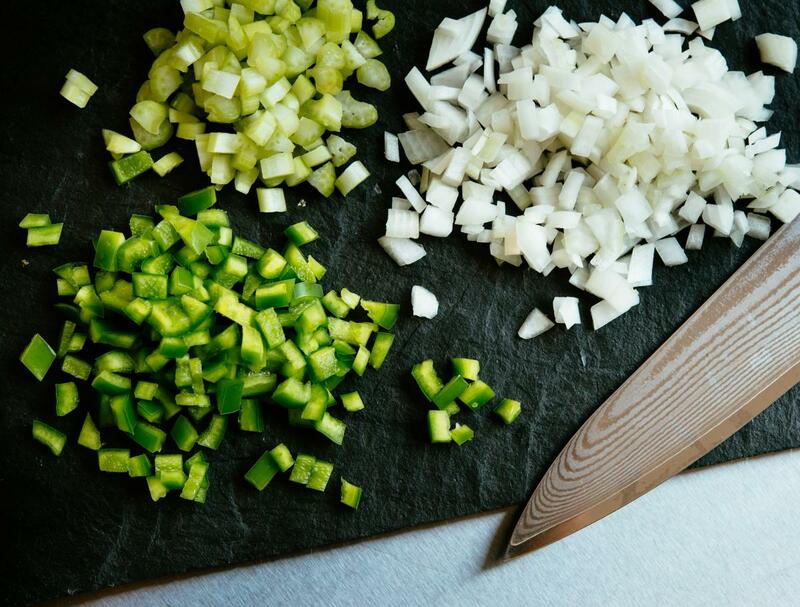 A slow simmer coaxed spicy and aromatic flavors from tasso, a heavily salted and spicy cut of pork, and the Cajun mirepoix of onions, green peppers, and celery, held sacred as the Cajun “trinity”. It was always served over rice, sometimes with potato salad, and sometimes thickened by a little file’ (dried sassafrass leaves) if the gumbo was immature. But it was not something I would dare call a soup. Gumbo, to me, was sui generis. Ask folks from closer to New Orleans what gumbos their mothers made and you might wonder if you’re talking about the same food. East of the Mississippi gumbo is typically a less hardy dish. Like my mom’s, it’s served over rice but maybe not as much. The roux is lighter, the broth is thickened with okra, brightened with tomatoes and finished with lumps of crab or shrimp or oysters or whatever seafood is fresh and available. No old guard New Orleanian, as far as I know, serves it with potato salad. Mary Tutwiler, a New Orleans- born/Lafayette-transplanted food writer and chef, grew up with a notion of gumbo more similar to that Campbell’s tin can. For Mary and generations of New Orleanians before her, gumbo was okra and tomatoes and pretty much all of the seafood you could get your hands on. The content of the pot was thrown together by the cosmopolitan port scene of late 18th and 19th century New Orleans. Gumbo evolved into a multifaceted dish complete with contributions from the city’s many heralded nations. 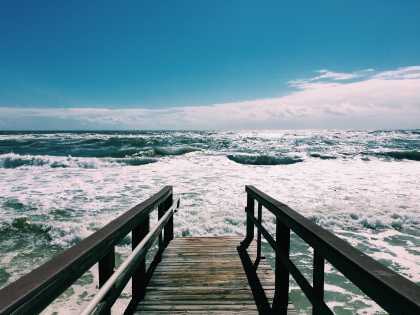 From the Spanish early gumbos stocked ham, from the aforementioned West African slaves came okra and a name, from the Choctaw tribes file’, and from the bounty of the Gulf of Mexico an abundance of seafood. 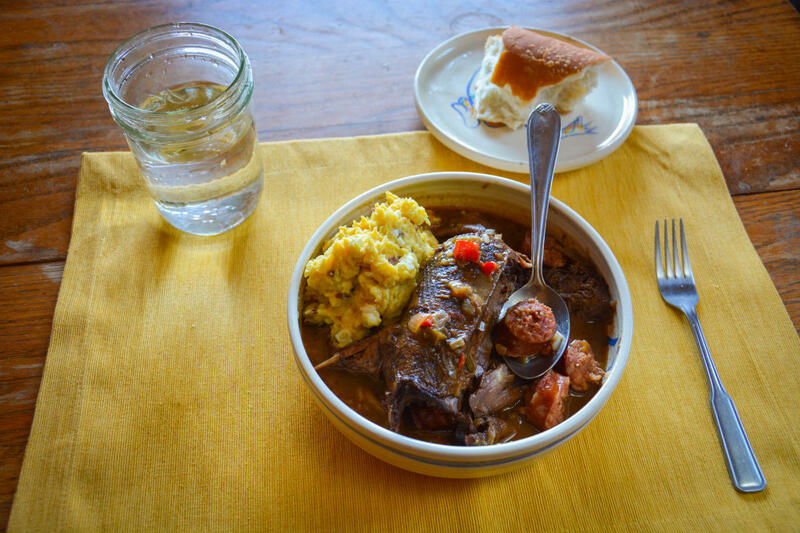 When Mary arrived in Lafayette in the 1970s, she first encountered poultry and sausage gumbos. “I had never seen or tasted chicken and sausage gumbo, and that was the only gumbo out here,” she told me. There she ate darker, richer-textured varieties like the smoked duck and andouille gumbo Chef Pat Mould created at the seminal Lafayette eatery Charly G’s in the 1980s, bringing hunting camp gumbo fare to the burgeoning restaurant scene. Its inheritance was the southwest Louisiana campfire gumbos, to which hunters brought game to the pot, adorning their stocks with browned meat and sharing beers after a winter hunt. 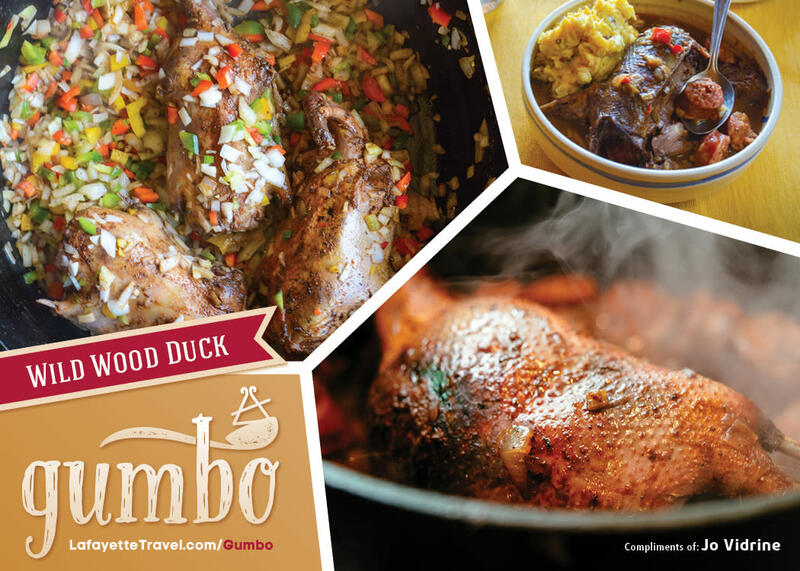 While gumbos speak different languages, they have a common root: roux, a thickener made of flour browned in oil. Roux in general is credited to Louisiana’s French heritage, though others have suggested that the browning of starches comes from Native American cooking techniques. Louisiana tribes like Choctaws and Houmas were known to brown corn meal to add flavor and preserve them. French-influenced communities such as colonial African slaves and Acadian exiles would have been familiar with the technique via browned butters and bechamel in French cooking, and adopted it to their needs. 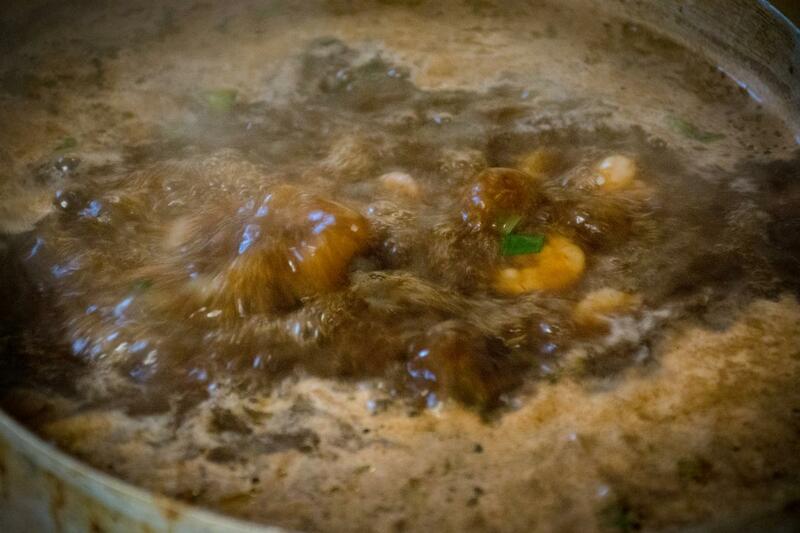 Like everything else in a gumbo, how dark your roux gets depends on where you live. 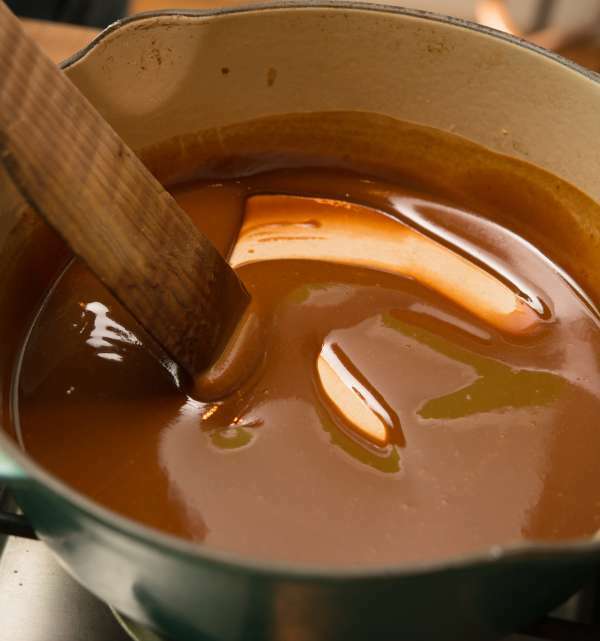 Closer to New Orleans, roux tends toward lighter shades, looking at its darkest like light caramel. The further west you go, a dark roux can trick the unitiated into believing it’s a pan of simmering chocolate ganache, a mistake often made by sweet-toothed kids around Christmas. The exact reason for the variance is unclear, though best guesses are that roux colors change to accommodate different proteins: lighter roux for delicate meats like seafood and darker roux for gamier fare like poultry or sausage. 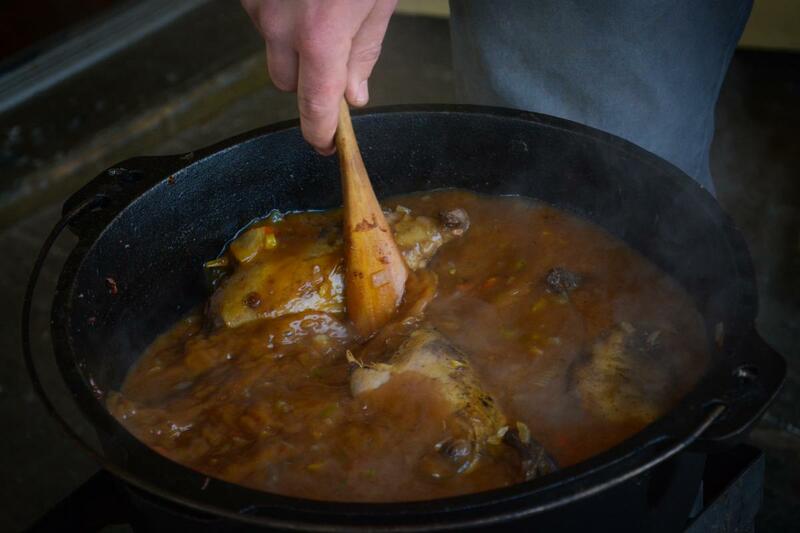 Once the roux is in the stock, however, gumbos of different shades and flavors blossom across the bayous. Taking in the variety, it becomes readily clear that gumbo is not so much a singular dish. 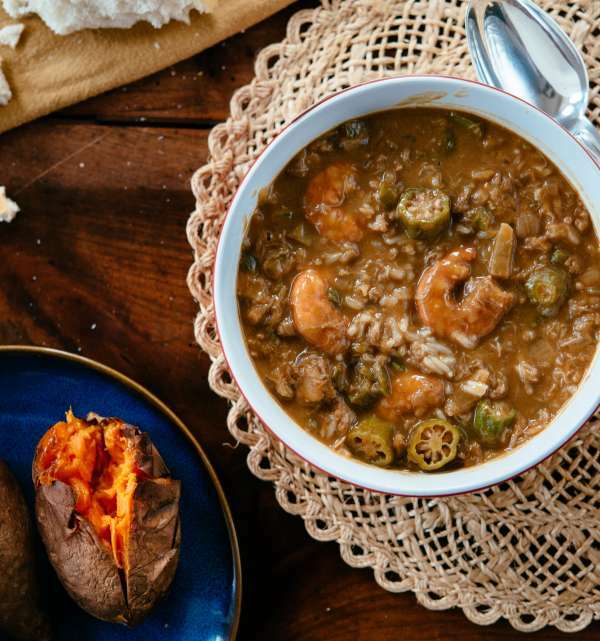 According to folklorist John Laudun, “gumbo is not a word, it’s a syntax, a way of putting something together.” It reveals a concentric rather than linear evolution of the food, bubbling from identical cultural stews scattered throughout southern Louisiana. Germans, French, Spaniards, Italians, Africans, and Native Americans fell into cultural exchange throughout the state. Thus, the same kinds of influences abound across the various parish lines, and are responsible for simultaneous innovation in a Louisiana national dish that is more exceptions than rules. 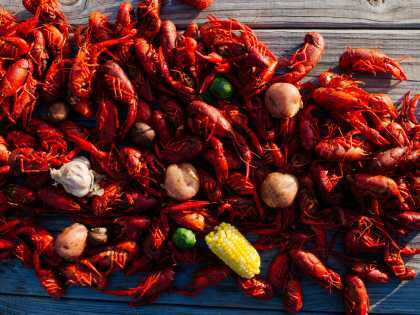 Citizens of Vermillion Parish and St. Mary Parish in south Acadiana are just as likely to include seafood in their gumbos as the Creoles of New Orleans. 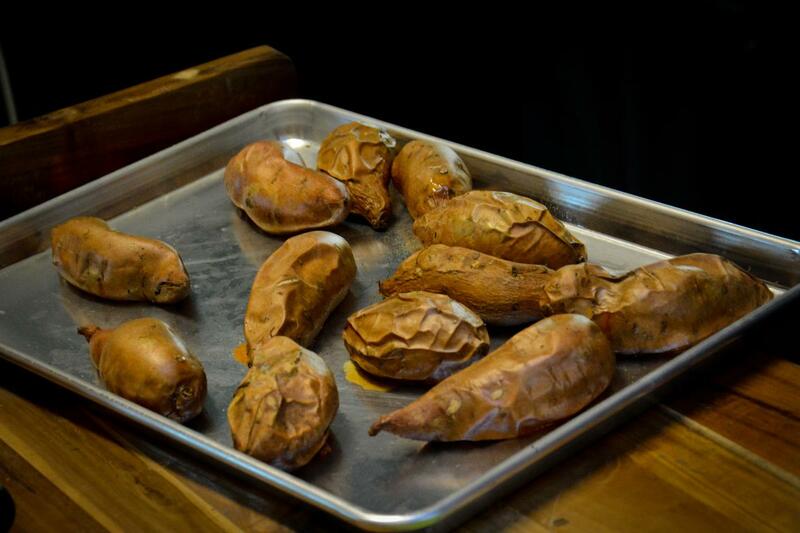 Some parts of northern Acadiana include sweet potatoes, while garlic makes its way into pots along the Bayou Teche where Italian heritage is prominent. 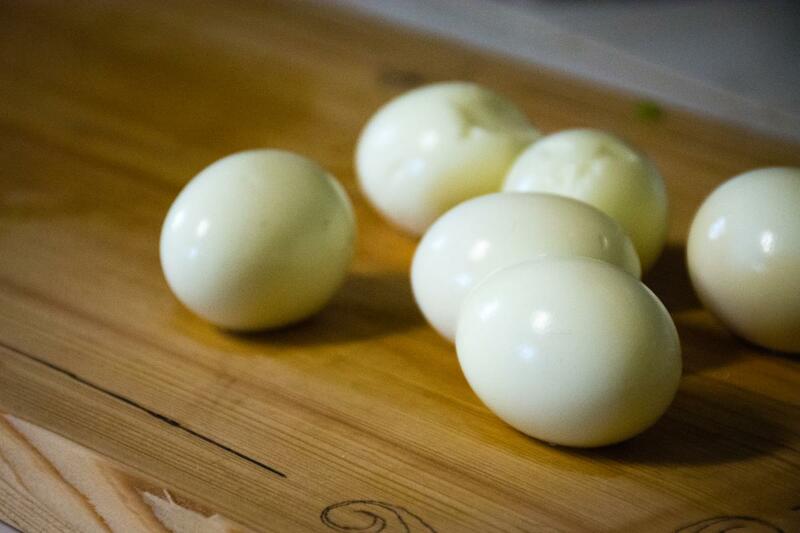 Eggs are sometimes thrown to the mix to add protein to shrimp gumbos on a stretched budget, soaking up the briny shrimp flavors. It’s a heterogeneous landscape. Where I went wrong on my quest was trying to track down a universal definition for gumbo. Gumbo is not one thing. But its definition is nevertheless apparent. For something to truly be gumbo it must participate in the unique Louisiana culinary heritage of Cajuns, Creoles, Spaniards, Germans, Italians, Irish, Choctaws, Coushattas, Houmas, and all kinds of other peoples, places and things. It more often than not will have a roux, which will come in varying volumes, shades, and tastes. It will be served with a spoonful or cupful of rice, or thickened with okra or file’, or enriched by poultry marrow and andouille smoke. It may come from New Orleans, but it’s at home in Lafayette. And no matter how your mother made hers, you will know a gumbo when you see it. During Acadiana’s winter gumbo season, it’s not uncommon to get party invitations that sound something like: “Come on over Saturday. I’m making a gumbo.” Making a gumbo, in this sense, is less about simmering seafood, chicken, or sausage in a roux-thickened stock, as it is spending an evening with loved ones. The warm company of close friends and an ice chest of cold beer are essential ingredients to these gumbo recipes, as folks gather while the gumbo is still bubbling away gently in the pot, hours from being ladled into eager bowls. 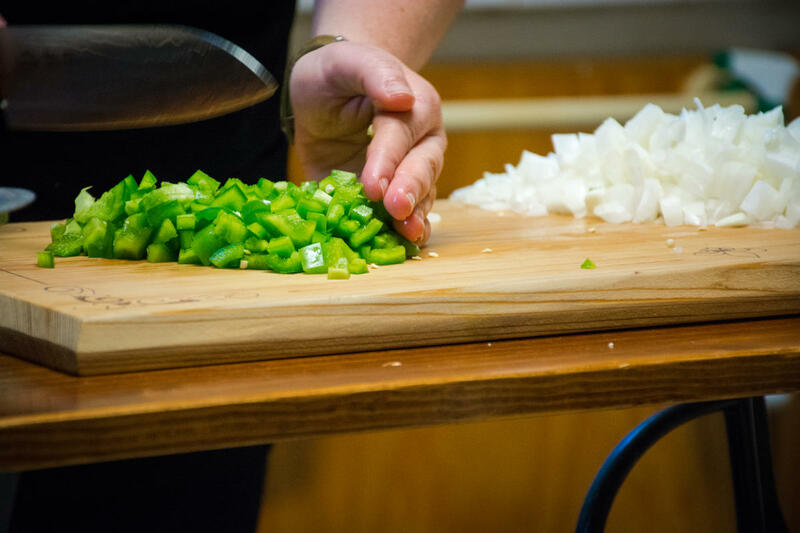 For some locals, like self-described “Freelance Cajun” Jo Vidrine, the gumbo communion begins long before the onions, bell peppers, and celery are chopped into the trinity. Jo and his comrades begin their gumbos with a 3:30 AM wake-up call to hunt wood duck around the village of Estherwood, thirty-five miles due west of Lafayette. You could look at it as the first in a five-step recipe for a twenty-four hour duck and sausage gumbo. First, hunt your limit of wild wood duck. Second, pluck and clean the fowl. Third, nap. Fourth, cook gumbo. Fifth, dance the night away. Wild wood duck, Jo muses, is what separates his duck and sausage gumbo from the sort you find in Lafayette’s restaurants. It’s something you literally can’t buy in stores, and that experience is essential to the earthiness of the recipe. “I know who shot it. I know who cleaned it. I know what went into making it,” he says. 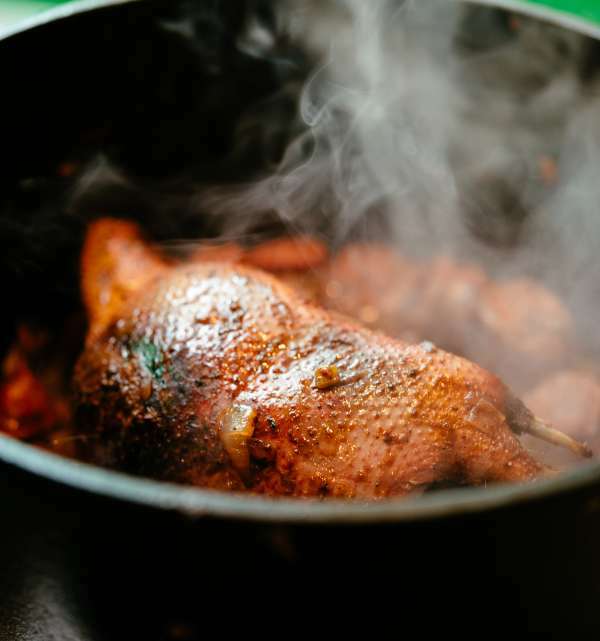 The flavor base of the gumbo is essentially a duck gravy: whole birds browned in a cast iron pot, their fat rendered into flavor and deglazed with water, stock, or even beer, if it’s the only liquid in grabbing distance. He thins the duck gravy with boiling stock, dollops of roux dissolving into a dark cloud, and simmers the mixture with homemade smoked pork sausage. The recipe is inexact, but it’s never complete without adding a few friends around to chat while waiting for the duck to fall off the bone. If gumbo is a social dish, then Jo’s is a fais-do-do that is equal parts supper club, ad hoc dance hall, and celebration of the hunt. 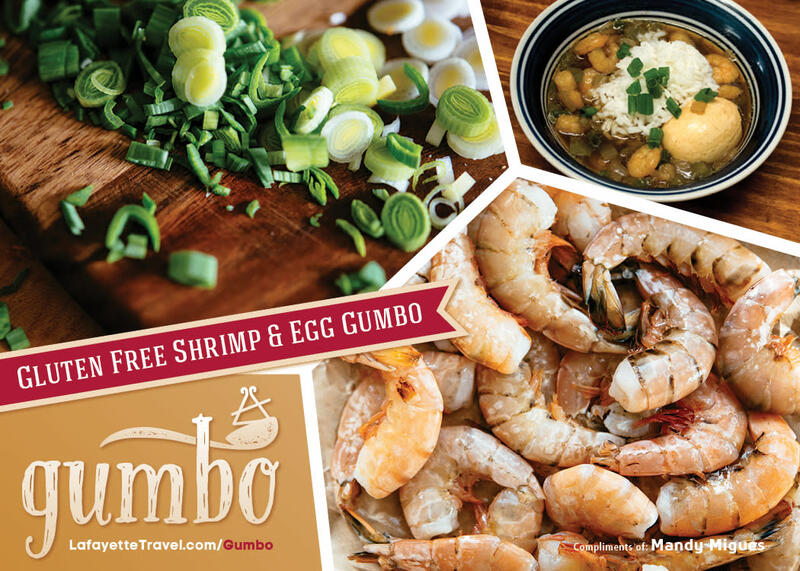 When he’s making a gumbo, he’s not just cooking food, he’s cooking up a party. “Cooking is a social event for me. Even if there was no food or music, the people would have a good time,” he says. He spends so much time hunting, prepping, cooking, and entertaining that he and his chief partner in crime Jay Miller are newlyweds on their wedding day: around for the party, but never getting to eat. Eating gumbo is beside the point, however. With great company the gumbo lasts all night, long after every last morsel is eaten. Food may have been the bait, but the party balloons well into the evening, often into the crisp and dim winter mornings. When Jo makes gumbo, he is making time for his friends and family. 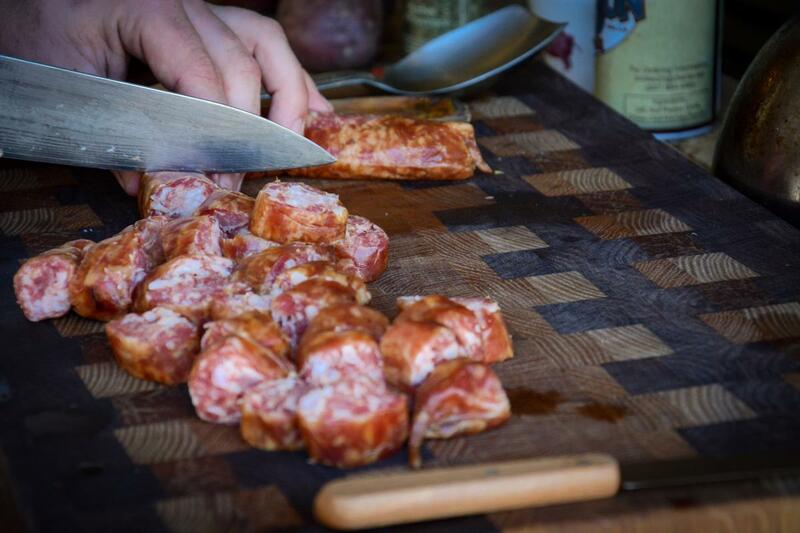 His is not just the duck and sausage in savory juice. It’s fiddles on the front porch harmonizing traditional Cajun melodies. It’s dancing till dawn. 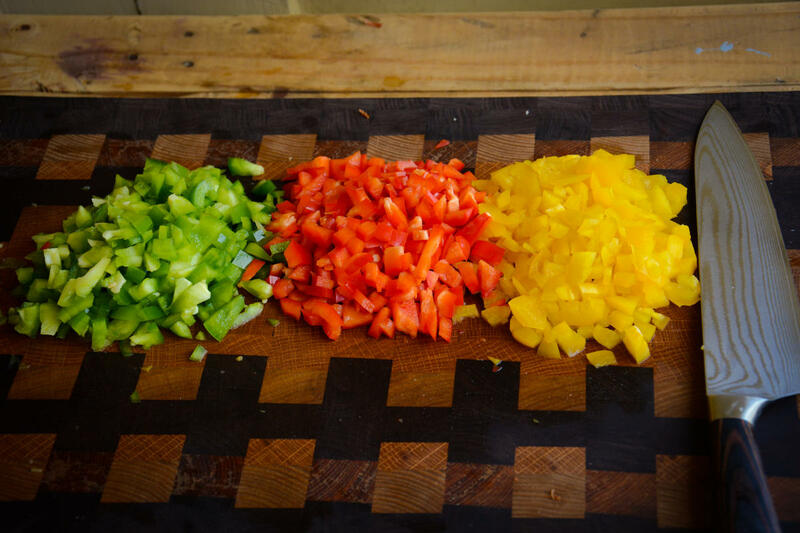 Making a gumbo is just another way of passing a good time. Click on the image below to download the recipe. Three weeks into starting a gluten free diet, Mandy Migues knew she had to get creative to keep eating what she loved. The limitations imposed by a strict gluten-free diet denied her the joys of her grandma’s Cajun cooking, an oral history of recipes she used to make a home menu of Louisiana favorites. The thought of giving that up, even to improve her day-to-day health, was devastating. The problem with Cajun and Creole cooking for the gluten-free diet is that it usually starts with roux, a mixture of browned wheat flour and oil that is used as a thickening base to many Louisiana staples. Wheat flour, as any gluten-free diner will tell you, is kryptonite to the gluten-sensitive. To imagine a roux-less life for Mandy, would mean a life without most of her favorite foods, a problem that needed an immediate solution. “I needed to make sure I had roux in my life. The roux goes into shrimp stew, chicken stew, sauce piquante,” Mandy says. In short, roux was the key to continuing her life as normal. 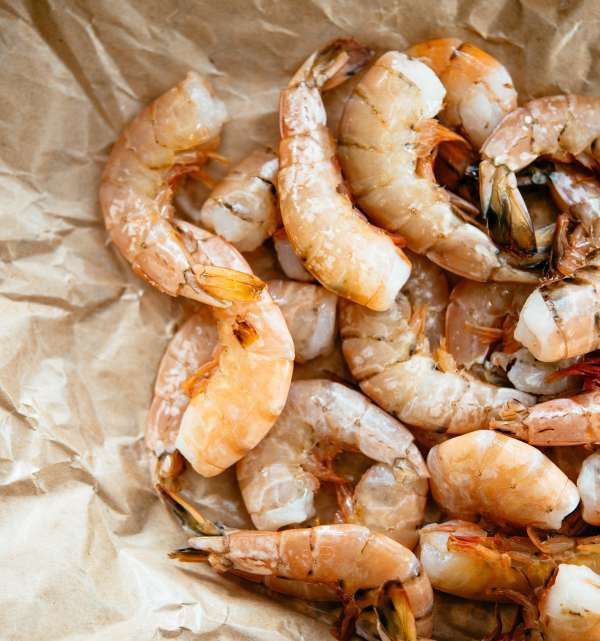 When a friend suggested substituting rice flour for the traditional wheat flour in her roux, the innovation reopened Mandy’s connection to her family’s food traditions through a variety of dishes, not the least of which was her grandmother’s shrimp and egg gumbo. Skeptical though she may have been, the promise of a gluten free version of a family staple was too good not to try, and she set out to a make a gluten-free version of her childhood favorite. 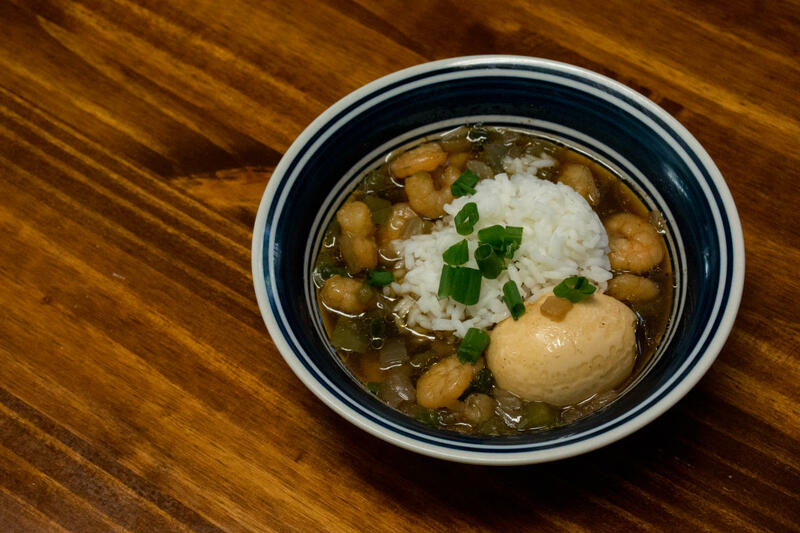 Besides the rice flour substitution, the recipe for the shrimp and egg gumbo was unchanged. 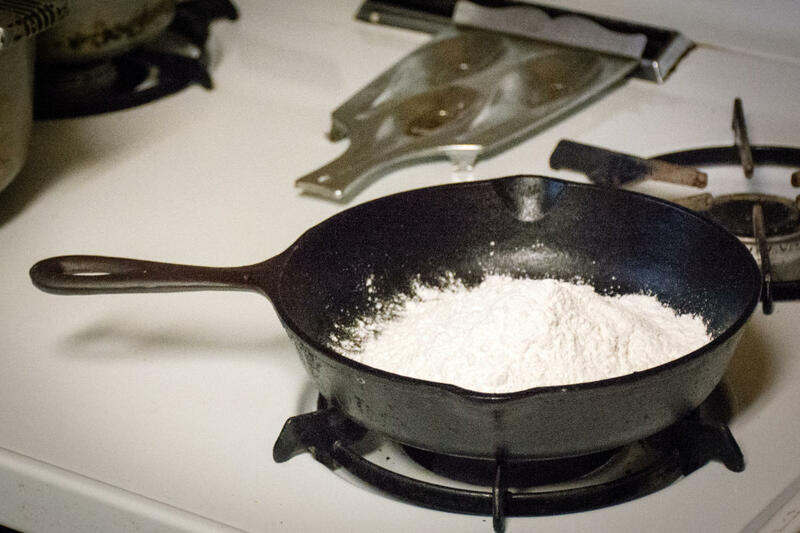 She began with a roux of three parts flour to four parts oil, browned to nearly blackened in a cast-iron skillet. Once the roux reached a dark chocolate color, she sautéed onions and green peppers in the mixture until softened and immersed in the deep brown folds. She found the rice flour browned somewhat faster than the wheat she was accustomed to, but otherwise showed no difference, at least by appearance. She dissolved the roux by the spoonful into a gumbo pot of boiling water, tossing in shrimp and hard-boiled eggs, and cooking them till the shrimp were done. She ladled a helping over rice with a side of her “no trash”, no-nonsense potato salad of eggs, potatoes, mayo, and Creole seasoning (thankfully gluten-free in its original form). The results? Well, the rice flour made no difference whatsoever, which in this experiment was the exact result she wanted. On first bite her tongue recognized it for what it was: a roux-less but genuine gumbo article. “It was roux. It was gumbo. It worked!” she remembered. The great gluten-free gumbo experiment was a resounding success, at least as far she was concerned. 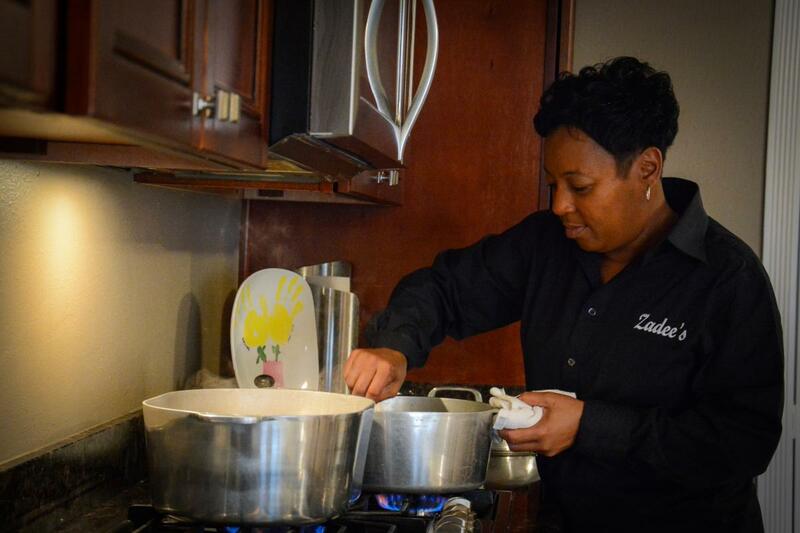 Mandy has since served her gluten-free roux in a variety of family recipes, even variations of other gumbos. Most importantly, the rice flour alternative has as yet gone unnoticed by even the most discerning of Cajun palates. 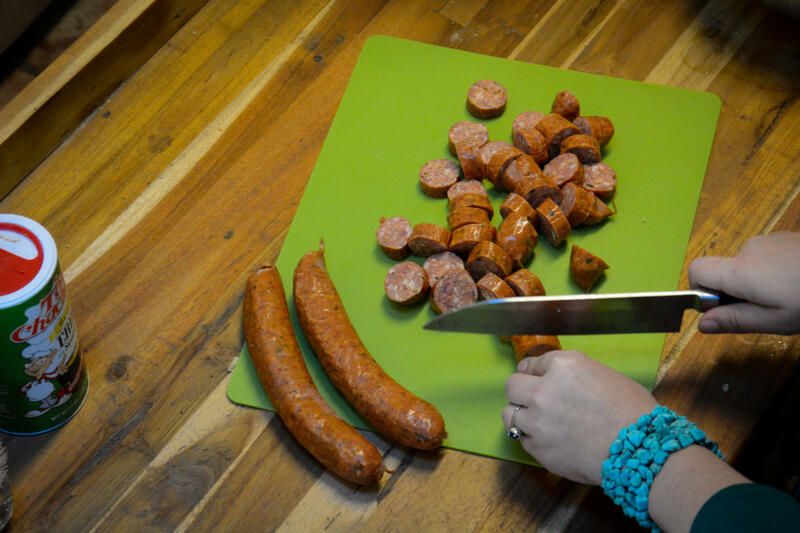 Fooling well-seasoned Cajun foodies, to Mandy, is the proof in the putting. “If there are Cajun people in the world that can’t taste the difference, then it can’t taste that bad”. Whether or not you agree that okra should go in gumbo, the vegetable is inextricably linked to gumbo’s birth in the cultural stews of New Orleans. Slaves arriving at port in the 18th century brought with them the slimy, seedy, furry, rich and hardy vegetable from West Africa, which they called kimgombo in the Bantu dialect. It was tossed into chicken stocks and seafood stocks, served over starches, combined with Spanish chaurice and ham, German sausages, and French roux’s. Its name dropped the kim, subbed in a “u”, and gave Louisiana’s national dish a name. 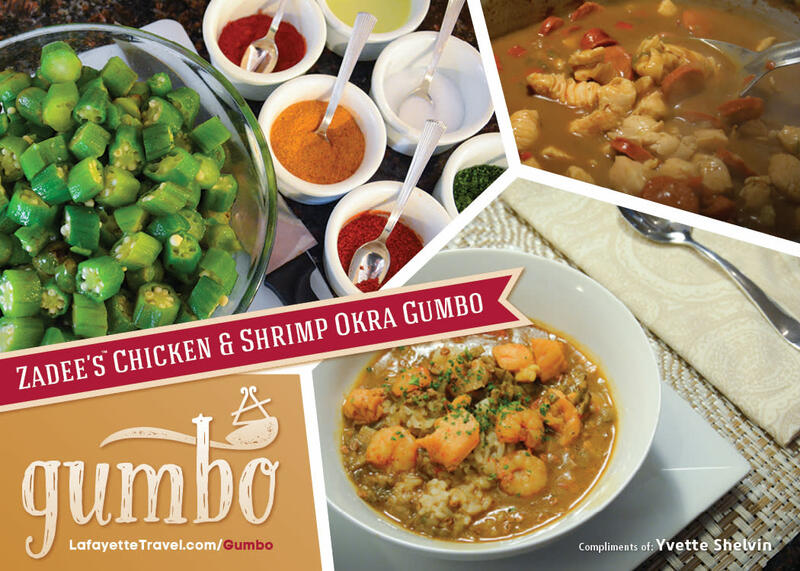 Despite it’s intimate role in gumbo’s origin, inclusion of okra in a gumbo is often seen as a polarizing difference among gumbo variations from either side of the Mississippi river. An oversimplification of the debate would mislead the uninitiated into assuming that okra is always excluded in the darker, game-heavier gumbos found west of the river in Acadiana, while abundant in the soupier seafood gumbos of New Orleans. But proliferation and distribution okra gumbos doesn’t really shake down as simply as New Orleans “yes” and Acadiana “no”. Folks in various parts of Acadiana are, despite what’s often misunderstood to be the case, quite fond of okra in their gumbos. Where they differ is in their application of the vegetable, and the role it plays in their gumbo recipes. 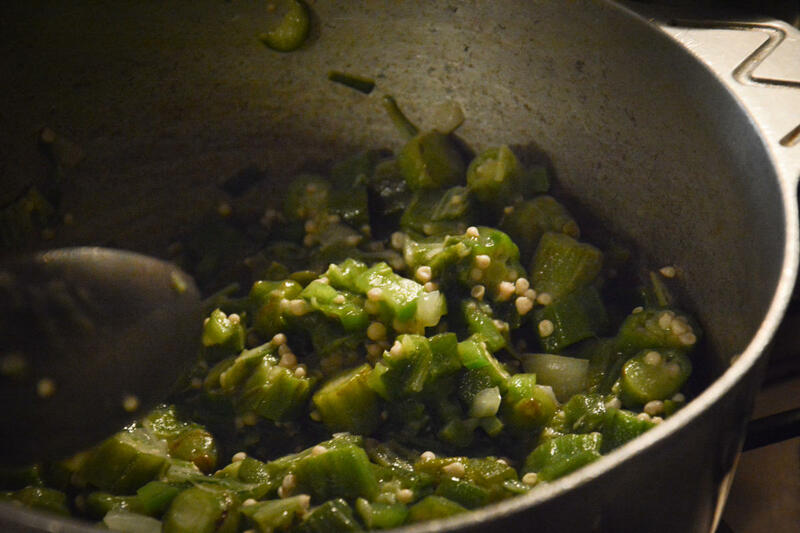 For New Orleans gumbos, okra is typically added fresh to utilize the syrupy innards as a natural thickening agent. 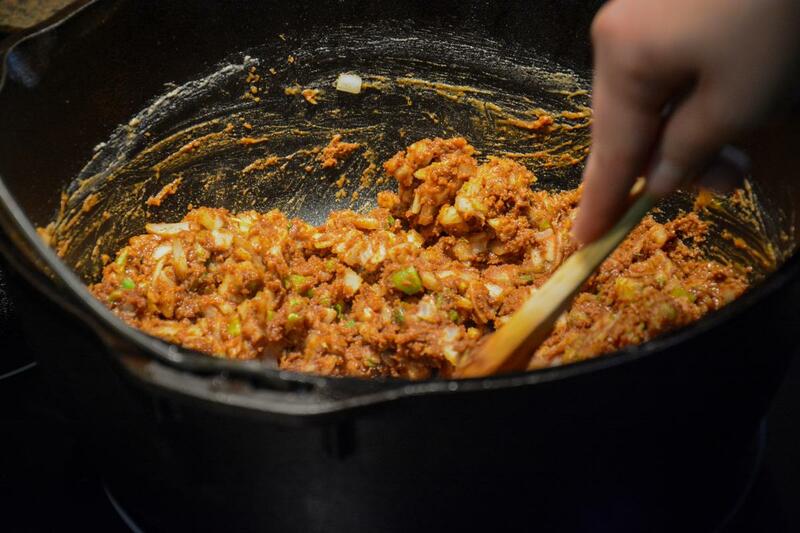 Gumbos in Acadiana, achieve their thickness from browned meats, heavier stocks, and larger volumes of dark roux, adding smothered okra for extra richness and a deep green flavor. Take Yvette Shelvin of Carencro, in the northern reaches of Lafayette Parish, the cultural capital of Acadiana. 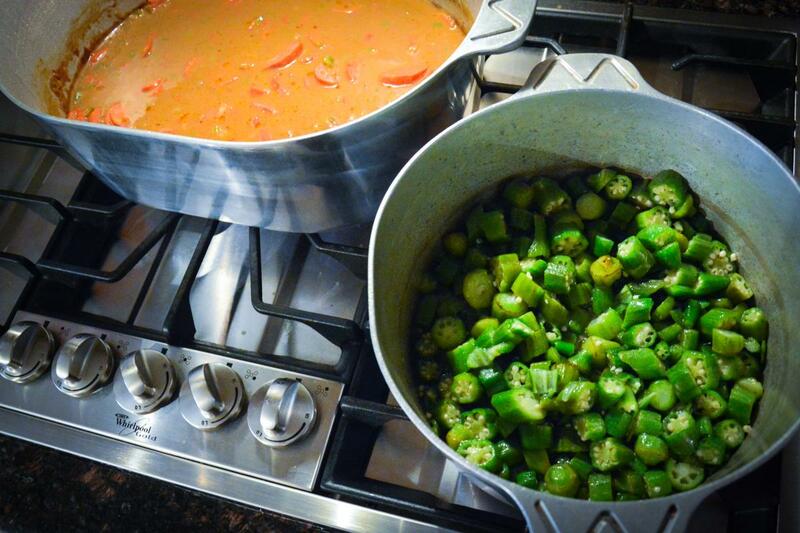 For generations, her family has picked, cleaned, chopped, and canned okra for use in a multitude of family recipes, most prominently gumbos. For ease of deployment, she smothers her okra in the low and lazy heat of a 250° oven. The furry skins are browned in vegetable oil with onions and bell pepper, and left to stew slowly until the interior goo renders into a rich pulp that can be frozen for months. At any given moment, Yvette has upwards of 25 to 30 mason jars full of smothered okra, extending the shelf life and use of it for well past the four-month okra season. She empties the jars into simmering pots of sausage and chicken to add savory richness to a gumbo already thick and velvety from a long reduction. Two gumbos can ever be alike, even when the ingredients are the same. A quick trip from Lafayette to New Orleans can be proof enough of that idiom, especially when it comes to how okra is prepared for use in gumbo. But shared truths do boil from the different gumbo pots simmering around the state. While okra may not look the same or even make it in every gumbo, the reasons for its original inclusion set the standard for inclusion of every ingredient that followed it: it’s delicious, versatile, and available. On a culinary spectrum that is typically understood to vary between brown and darker brown, gumbo z’herbes stands out as the lone shade of green. 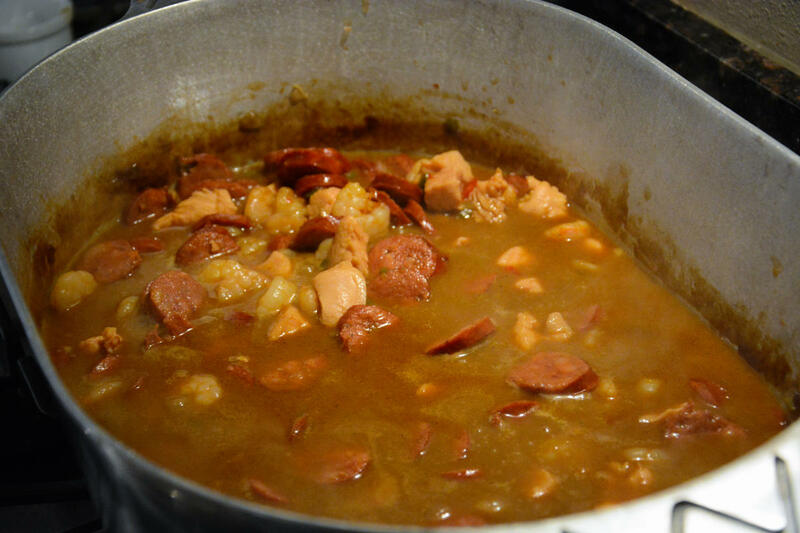 Generally associated with Lent in heavily Catholic southern Louisiana, the so-called “green gumbo” breaks most of the rules generally associated with gumbo. For starters, unlike its seafood and game-based cousins, the inclusion of animal proteins is optional. As its name would suggest, the primary flavor component of gumbo z’herbes is greens and herbs, and lots of them. Many recipes call for upwards of fifteen varieties of greens to be stewed, dissolved, and married in the eponymous gumbo pot. Collard greens, mustard greens, carrot greens, watercress, romaine, cabbage, beet tops, swiss chard, and kale are no strangers to this hearty, often meatless soup. Like any Louisiana dish, the origins of Gumbo Z’herbes are somewhat mythical. 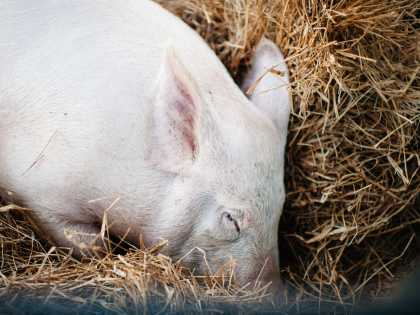 It’s association with the Lenten season and frequent omission of meats has contributed to the long held tradition that it was a Catholic nod to Good Friday fasting and abstinence. A kind of farewell to the flesh of a different sort meant to keep you honest with your Lenten sacrificing, and in the right dietary mindset ahead of Christianity’s most important holiday. Variations on the dish, however, lead to controversy on its cultural role. Frequently the hearty verdant flavors of green gumbo are buttressed by ham hocks, sausage, and pickled pork. Adherents to this variation maintain that green gumbo’s job is to prepare the faithful on Holy Thursday for a day’s worth of Good Friday fasting with a hearty and nutritious meal. Whichever way you cut it, it’s hard to separate any Louisiana dish with tradition, and the tradition of green gumbo is the Lenten season. 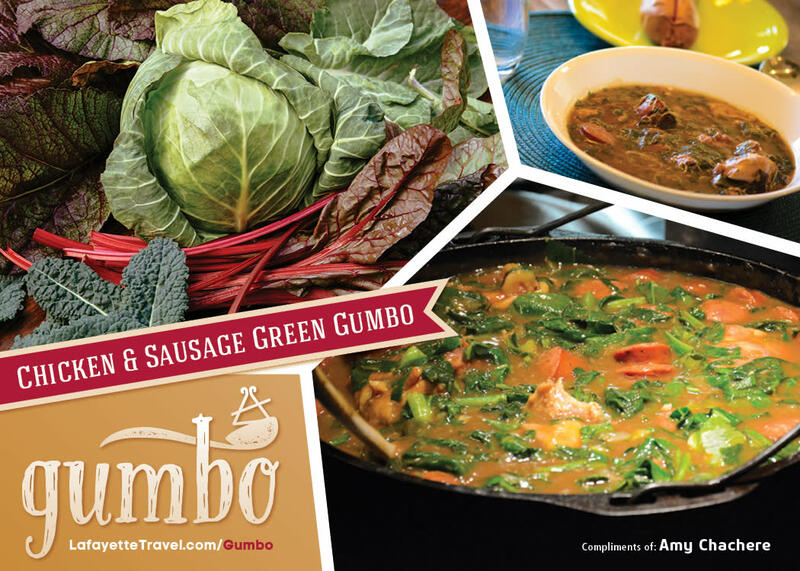 Sure to continue stirring up controversy in the making, green gumbo is perhaps the only “gumbo” that is served acceptably without roux. 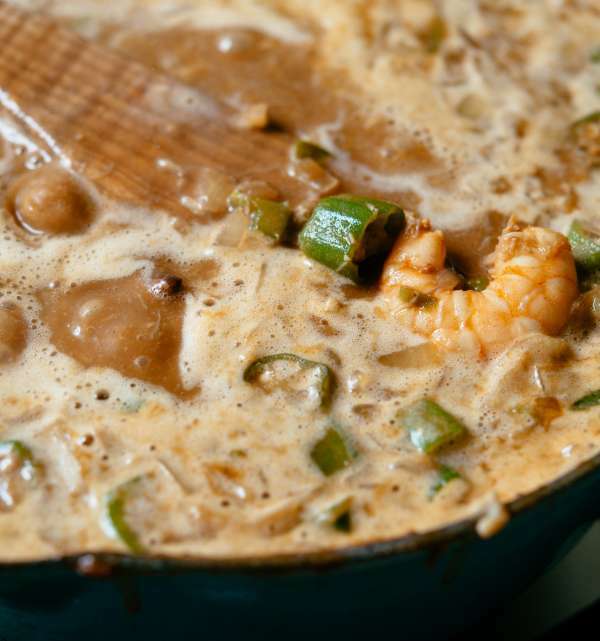 By many accounts what makes gumbo different than, say, chicken and okra soup, is its use of roux (a mixture of browned flour in oil) as a flavor base and thickening agent. 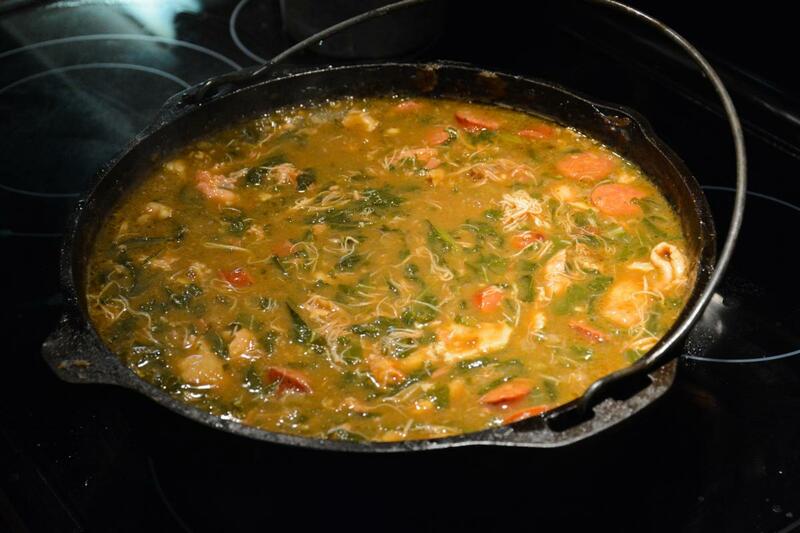 Green gumbo, however, enjoys the moniker without roux as a required ingredient. To be sure and to make culinary definition that much more complicated, it’s not uncommon to find roux in a gumbo z’herbes, even if many don’t include it. It begs the question, then, what makes a green gumbo a gumbo? While it is indeed served over rice like its extended gumbo family, that surely can’t be enough to call it gumbo. A purchase of chicken and rice soup at your grocery store should serve to rule rice out as the necessary condition. What makes green gumbo a gumbo is its laissez-faire, everyone-in-the-pot diversity of preparation. Gumbo, in general, as noted as early as 1885’s La Cuisine Creole is an effective vehicle for leftovers and scraps of all sources, be they flora or fauna. Green gumbo in particular participates in that tradition with a typical approach, if not with the typical ingredients. Why is green gumbo a gumbo if it breaks so many gumbo rules? In short, because Louisiana cooks make it, and because Louisiana cooks say so.